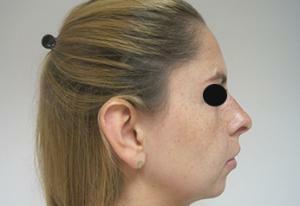 Chin augmentation surgery refines the relationship between your nose and jaw. When someone views your profile, your chin and nose have a specific relationship to each other, and that relationship has a major impact on the appearance of the lower third portion of the face. If your chin is receding, your nose can look too large and your neck too fleshy. On the other hand, if your chin is too prominent, then it can make your nose look small and your facial profile out of balance. To achieve the optimal balance for you, a chin implant can be surgically inserted, or your chin can be resculpted as needed, thus providing you with a more harmonious balance between the middle and lower thirds of the face when viewed in profile. Chin augmentation can add definition to the entire jawline. Often chin implant surgery is combined with submental liposuction (suctioning of fat under the jaw in the neck) to really define and highlight the appearance of the border of the mandible (lower jaw). 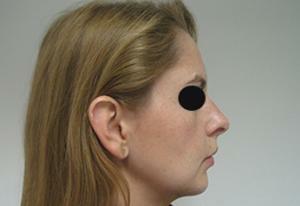 People who are good candidates for chin augmentation have a “weak” appearing chin relative to the nose and/or forehead when viewed from the side (profile view). Often times, the chin may appear weak from the frontal perspective as well. You must have a mandible (lower jaw) that lies in proper position relative to the maxilla (upper jaw). You cannot be a patient with a retrognathic mandible. A retrognathic lower jaw is a jaw that lies posterior to its normal relationship with the maxilla (upper jaw). This can occur because the lower jaw has not developed fully and is too small or it can be normal size but improperly positioned (too posteriorly). Retrognathia also gives the appearance of having a weak chin, however surgery to reposition the bone must be performed in this case. Chin augmentation with a prosthetic implant is not used in patients that have a retrognathic mandible. Ideal chin augmentation candidates must also be in good health, live in New York City (or be willing to travel), and be motivated to follow Dr. Cangello’s pre-operative and post-operative instructions. 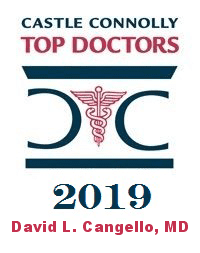 Dr. Cangello is committed to achieving the best results possible. During your initial consultation for chin implant surgery, Dr. Cangello and his staff will review the pre-operative plan for you. The plan for your chin augmentation is designed for your unique needs, to make sure that you have the best outcome possible. Your pre-op plan may include changes in diet and other habits that impact your health. You will be advised to avoid ANY nicotine-containing products for at least two to four weeks before and after surgery. 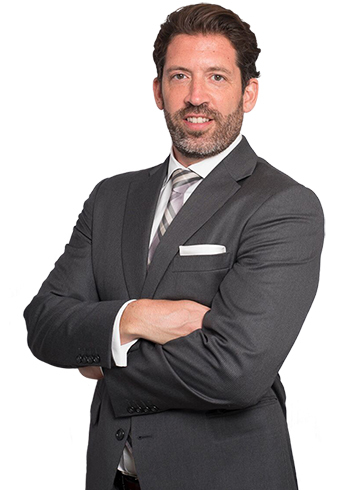 Dr. Cangello and his staff will provide you with instructions for the days leading up to your surgery. You will be asked to stop certain medications and supplements. You may also be told not to eat beginning at midnight on the day of your surgery. For patients who will have their chin augmentation under IV (intravenous) sedation, pre-operative medical clearance by your physician (Dr. Cangello can provide a referral if you do not have one) will need to be obtained prior to surgery to ensure that you are medically fit to undergo the procedure. Finally, Dr. Cangello will explain your post-operative plan. His staff will give you prescriptions to fill prior to surgery and ask you to find someone to accompany you home after your procedure. Your chin implant surgery will be performed at Dr. Cangello’s New York City office located in downtown Manhattan. On site is a fully accredited (AAASF) state-of-the-art operating room. You are encouraged to ask for a tour of the operating facility when you come in for your consultation. Chin augmentation surgery generally takes around an hour. The procedure can be done under local anesthesia alone. However, it is usually done under a combination of local anesthesia (administered by Dr. Cangello) and intravenous (IV) sedation provided by a board certified anesthesiologist. You will not experience any anxiety or feel any pain during the surgery, nor will you have any recollection of the procedure if it is performed under IV sedation. In the operating room you will be comfortably positioned on the operating table. Intravenous anesthesia will be administered by the anesthesiologist to first relax you and then put you to sleep. Dr. Cangello will inject local anesthetic so that you feel no pain during the procedure. There are two incisions that are commonly used for chin augmentation. The approach can be through the mouth where an incision is made a few centimeters below the gum line. Or it can be outside the mouth on the skin in a naturally occurring crease that exists a few centimeters below and behind the chin. The advantage of making the incision in the skin is that when the implant is placed, it is not exposed to bacteria which are in the mouth. Since the implant is a foreign body and it is permanent, minimizing exposure to bacteria and minimizing the risk of infection around the implant are critically important. As such, Dr. Cangello prefers to make the incision in the skin under the chin. The scar is virtually imperceptible. After the incision is made a space is created for the implant so that it can be situated directly on top of the bone of the mandible (lower jaw). The pocket for the implant is made very precisely so that the implant does not move and so that it lies in the proper position. If the implant is not seated in the proper position it will have a visibly crooked appearance. Creation of the pocket requires precise surgical skill so that once the implant is inserted it remains properly situated. Dr. Cangello uses nonporous silicone implants from Implantech. Once the implant is inserted into the pocket sutures through the implant and surrounding soft tissue are used to secure the implant in place, creating a new, more defined chin with improved projection for the patient. Access for placement of the chin implant is achieved using a small incision under your chin so post-surgical scarring will be minimal or invisible. BioCorneum – composed of silicone gel in liquid form – is a scar-reduction product that is quite helpful and effective for scar care. Dr. Cangello recommends that you begin to apply it 2 weeks after your surgery, when the wound is completely closed with no opening(s) in the skin. It is applied twice daily to clean skin. We can also provide laser scar reduction if necessary. As with all plastic surgery procedures, swelling and bruising is normal, and the chin must be treated gently while stitches and/or sutures are in place and during the healing process. You may be required to adhere to a liquid or soft foods diet for the first couple of days after the procedure. The sutures are removed in about five days, and you should be able to resume work after a few days. Strenuous activity can be resumed in a few weeks and activity requiring physical contact should be postponed until 6-8 weeks postoperative. Most of the swelling should subside after six weeks, with all swelling reduced and the final appearance of your new chin emerging after three to four months. Silicone chin implants generally last for a lifetime. Please call the office at (212) 644-4416 to set up a consultation or if you have any questions about this procedure that you would like answered.